SharkBite, the innovative range of metal push-fit fittings suitable for use with four different types of pipe, from Reliance Worldwide Corporation (UK) Ltd, now completes their whole system solution with the availability of their new SharkBite cross linked PEX barrier pipe as part of the range. SharkBite PEX barrier pipe has been developed, tested and approved for use up to 6 bar @ 95oC on any cold water application and provides the ultimate flexibility for pipe to be quickly and easily threaded behind cavity walls and through ducts. 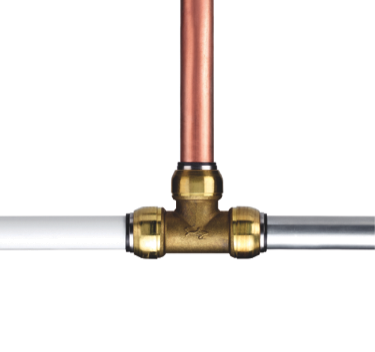 Used as complete system, with SharkBite slim-line push-fit ultra low-lead brass fittings, installers can complete even faster, easier installations without compromising integrity and whilst ensuring a neat, tidy, professional installation every time. SharkBite PEX barrier pipe is BSi Kite mark approved under BS7291 part 3, it is fully WRAS and IAB approved. Available in 15mm, 22mm and 28mm diameter sizes in 25m or 50m length coils or in 15mm and 22mm diameters in 3 metre straight lengths. Pipe liners are also available in the corresponding sizes. James Bell, SharkBite Brand Director comments ‘SharkBite is all about saving time and convenience for the installer so offering our own SharkBite PEX barrier pipe enables installers to buy from just one brand for their complete system needs which is backed up by a solid 25 year guarantee for their complete ‘peace of mind’. SharkBite is the worlds most versatile, easy to fit, secure and watertight plumbing solutions brand. Offering fittings and valves that can be used with any of four different types of pipe (copper, pex, carbon steel and polybutylene) in any configuration, SharkBite is the ultimate modern plumbing solution offering flame-free jointing for hot and cold water applications. SharkBite fittings can be demounted and instantly reused reducing waste and further saving additional cost. Now with the availability of SharkBite PEX barrier pipe, SharkBite offers installers even more convenience and time saving benefits.